I think you mean a progressive income tax not sales tax. Albertans remind me of the saying, “everybody wants to go to heaven, but nobody wants to die”. They want all the services government provides, from social supports to health care, schools to highways, but they don’t want to pay for them. Can there be any other explanation for why they (and here I say “they” because while I live in Alberta, I still don’t consider myself an “Albertans”, and have never voted PC) keep re-electing these right-wing, anti-tax, small-government politicians? Is there any other jurisdiction in North America where, until very recently, the strongest opposition to an extreme right-wing government was an even more extreme right-wing party? Prentice has taken a lot of flak for his comment, but I think Alberta voters have nobody but themselves to blame, for electing these clowns over and over again. It is the public’s fault. We’ve demanded these crazy European-style social programs for too long, when it is in our best interests to have a private health care system, like the rest of the world. Time to wake up. Listen here! When I see 50% of my paychecks going to the Government damn rights I shouldnt have to pay for Healthcare and so on! Or how about the fact there is SOOOOO many people collecting wellfare that dont need it???? How about if you are requiring Government assistance YOU HAVE TO PASS A DRUG TEST. In order for me to go to work I have to. Or how about the Liberals being convinced that ALL CRIMINALS can be rehabilitated and the majority of our taxes paying for the Governments catch and release program! Come on PEOPLE wake up! How about the Eastern Canadians coming to Alberta to work just enough to collect EI and then go back east to collect Government Money! Then when some one does lose their job and need to collect EI they have to jump through hopes to get it. Or how about this, Woman collecting Welfare claiming her husband has left and she needs money, mean while her husband is still living there and they are living happily ever after and scamming the government and when the government is notified they try and with draw the accusations and say they are dismissing the case and continue to allow these people to steel from the government. Giver your heads a shake people! Its not just Alberta. And dont worry you all eastern canadians….Alberta will continue to fund your provinces so you guess can have cheap tution and so on! It’s time to look at the billions of dollars that Alberta provides to the National Equalizaion Program. We can no longer afford it. The premier needs to starting telling his friends in Qttawa … NO! I think what scares me the most is that going into this election we are not in a great position in terms of alternate choices. At least in past elections there were strong and well prepared opposition parties that voters perceived as being capable of the job, but our opposition parties are being forced into an early election with their pants (down so to speak). While many of my fellow Albertans are outraged at the attitude of the PC party in general and skeptical that Mr. Prentice isn’t just the flavor of this election I fear that unless opposition parties get it together quickly and start talking loudly we may indeed have another PC Majority simply for lack of real options. If we can mobilize all the groups the PC’s have disenfranchised our voices are most certainly louder than his privileged pals and we have a real chance of changing something, but history tells us that is hard to do. We need to move beyond being outraged on twitter and really coming together to change the end result. In so far as Albertans have been gullible enough to re-elect the same party since 1971, yes Albertans are culpable. That said, we cannot ignore the impact of creeping neoliberalism since the days of Ronald Reagan, and the successful demonization of centrist politics in this province after 1983. Frankly, the ruling party in this province isn’t what it presents itself to be. The last 3 premiers have made that abundantly clear. Prentice’s words and actions to date show it to be a party that feels beholden to the corporate world at the expense of the people. A reasonable taxation, royalty and savings regime is neither onerous nor difficult – unless you’re primary interest is keeping the occupants of the executive suites in Calgary happy. As for BCBlue’s quip about “european style social programs”, I’d much rather emulate Norway, Sweden or Finland on that front than the US – at least those countries recognize the value of investing in their citizens. Hmm. I won’t make a comment as to what is in our best interests (I think it’s obvious; others can do so), but certainly the last phrase is incorrect. All other G7 countries have a public health care system (different countries go about that in different ways). This fellow wouldn’t be wanting to compare Canada to a much poorer country in terms of type of health care system to be aspired to, would he? you need somebody to count your royalty money, 13 billion you could have bought the whole country health care. And the US of course has the highest cost and poorest results of any healthcare system in the developed world. Unless you consider letting the poor people die young to be a good result. Perhaps you do. Excellent article. The only way out of this mess for the people of Alberta is to elect someone that cares about everyone, to vote in the long-term interests of each other, of the province as a whole rather than their own short-term financial gain. Are we going to elect politicians who care about the people, or those who care about the richest few people? Their line is ‘vote for us and one day you’ll be one of the rich folks too’. Such a lie, can’t believe so many fall for it. A lot of these comments are ridiculous. Two major points – Out of the OECD/G20 countries, the vast majority have public health care. It is economically more sustainable and better in quality and access. Private health care is proven not to work – I know several people who would not be able to receive/afford treatment if we had a private system. Secondly, Equalization Payments do not effect our budget/debt – they are collected and distributed by the FEDERAL government according to a set formula to ensure equality of condition across Canada. 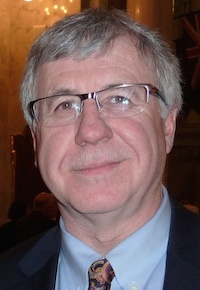 Alberta does not ‘give’ money to the Eastern provinces – the Federal government collects money from ALL provinces and distributes them based on need. Alberta has no control over this process or the amount of money it contributes/receives. The source for our financial issues are NOT overspending or welfare fraud – not to say that such fraud never occurs, but it does NOT occur to the degree of impacting our provincial finances. We spend the least amount on social services out of all the 10 provinces: if that accounts for 50% of our spending, it is because we have a revenue problem and are NOT taking in enough funding to manage programs more efficiently. We do not have a spending problem: as Dave states, we have a revenue problem that stems from poorly thought out Tory governments. Tax tax tax! Raise taxes. That’s the liberal solution to all problems. Forget the fact that Alberta brings in, BY FAR, the greatest revenue per capita and spends, BY FAR, the most revenue per capita in the country! A little bit of karma for those of you who’ve forgotten to take your meds. Ya. I’m talking to you BC Blue and Joe Joe with a side of Alberta Proud. And for a little insight into the minds that brought you guns for felons and cheap cancer care, I proffer these articles for your edification and enlightenment. Oh and this little gem too. I’m sure it would get the thumbs up from Mike Allen, that paragon of virtue in the PCAA caucus. We should have at least a 15% cut to public services. This is anything but “short sighted”, it is in our best interests. We have the highest public service cost in Canada. The problem is on the spending side, not the revenue side. Time for some serious slash and burn, and right to work legislation. There is a choice! 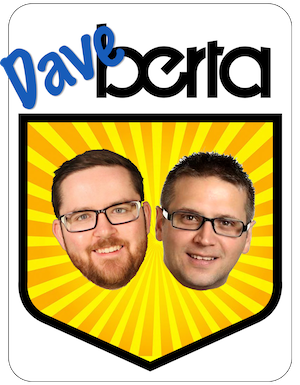 Visit the Alberta Party website. Read some of their news articles, especially Greg Clark’s address at the AGM. Get involved. Be the change you want to see! We not only need European-style social programs, BCBlue, we desperately need European-style government. Imagine where Albertans would be today if we had a government like the Norwegian one managing our natural resources. First of all, it’s unfair and unreasonable to blame our current problems on successive Tory governments since 1971. Specifically, Peter Lougheed went in the opposite direction, making sure that large swaths of oil royalty revenue ended up in the Heritage Fund, instead of in general revenue. So, if you want to blame the Tories, at least start at Getty, and probably really at Klein. In fact, I’ll give Ed Stelmach a pass, for at least making an effort in the right direction. It’s too bad oil money created the Wild Rose and got his own party to turn against him, to punish him for the attempt. His huge unexpected election majority in 2008 didn’t provide him with the mandate one would have expected, as it turned out. As for the next election, I can’t remember a time the Tories seemed so vulnerable. Wild Rose taught an entire generation of Albertans it’s okay to vote against the PC party, and Smith managed to make those voters mad at herself AND Prentice. There’s only one opposition party that doesn’t seem to be in disarray, so if Notley catches on during a campaign she might be able to overcome the branding issues the NDP have traditionally had in this province, organizing the anti-government vote to NDP candidates. The Tories only won the last election because they triangulated progressives’ fears of Wild Rose. Those progressive voters exist. Iveson and Nenshi aren’t mayors by accident. The face of this province has changed. Give electors one #PrenticeBlamesAlbertans moment during the writ period, and it’s going to get very interesting very quickly. I can’t wait! C. Averill, I don’t want to see change. We don’t need change. Things are just fine as they are. I’m completely sick and tired of hearing about “all” the people on public assistance who don’t need it. It’s a guarantee that it’s said by someone who has never had to apply for public assistance or they would know it’s next to inpossible to qualify for it. The federal government requires soldiers who have been honourably discharged from service because of career ending amputations to go to their doctors once a year for proof that their legs or arms haven’t spontaneously grown back. Because limbs tend to do that among certain segments of the population. Test people for drugs to get social assistance? This is without a doubt the single stupidest, most expensive, unnecessary cost we could possibly add to our health care system. For those receiving EI or AISH, the most they are able to receive is $408 & $397/week. Although the government no longer uses DynaLife, the cost per random drug test for Children’s Services clients was $215 to the department. The State of Tennessee implemented this horror show and 16,017 people were tested for their eligibility for benefits and 37 were found to have an illegal drug in their system. Of course, they probably got it from a friend because as hard as this may be to believe, in Alberta, after you’ve paid for rent, utilities, insurance, groceries, transportation,, clothing, cleaning and hygiene products., phone, internet, and maybe cable with $1588 a month, there’s not a lot of money left over for wild nights of binging on meth, heroin, cocaine or anything else. If the costs were the same in Tennessee as they would be here, this idea would cost taxpayers $3,443,665/week or month, depending on how often you want to test and would save us, at most $15,096 a week in denied benefits. The above is a perfect illustration of why we need to keep conservatives hands off our public purse strings. Hello Mr. Kettle, I have Mrs. Pot on line one. Shall I tell her you will call her black? Help support the correct hashtags. 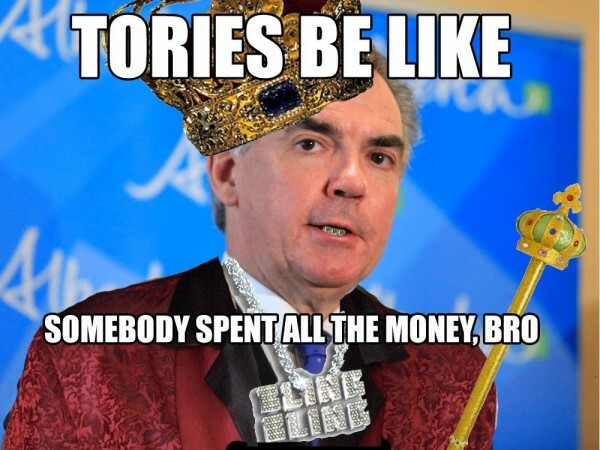 Tweet using #AlbertansBlamePrentice and #AlbertansBlamePCs !!! 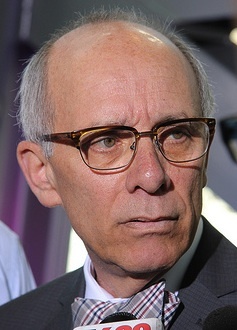 I think the Preem just called Albertans a bunch of idiots and still they are going to vote his party in, despite being insulted and blamed for being in the fiscal hole. The politicians must be laughing at how they can keep making fools of stupid Albertans, insult them and keep asking for their vote. The wealthy benefit most from buying PC party favors and are least affected when bad decisions are made. Where have all the middle class tax dollars gone. Certainly not towards sustainable development of infastructure, healthcare and education. The wealthy can cue jump healthcare and educate their offspring in private schools while avoiding fair taxation. The PC party faithful are rewarded with fat paychecks, buyouts and pensions. The PCs have always looked after their own and always will. Prentice is no better and has the nerve to blame those victimized by PC arrogance and mismanagement. If only those that vote PC could be held accountable and made to pay for the sorry state affairs. So much for democracy. What we have had since 1971 is an oligarchy. Joe Joe? If 50% of your pay cheque is going to government and you live in Alberta then you’d be better off paying someone who knows how to do taxes. Yes we have a revenue problem, not shocking when we so heavily depended on oil. The oil cash will come back in the not so distant future, however with no savings to ride it out times will be tough. Let us all learn a lesson here and ensure new revenue streams are developed. Cut spending….really!…we continually ask the government to do more and more and more….so do the opposition parties….more for health care, more for education, more for large infrastructure projects. Why do we never hear about the cost of our legal system? Great video. Read menu items at the bottom of their web page. You will learn how the money went down the Conservative toilet and solutions to our bad Conservative economic policies without bringing in sales taxes. The only addition I would add is we need Participatory Democracy where people make decisions, not just politicians. to learn how Albertans can help make up the budget for the better. This guy will reveal his true colours…and it won’t be rosey…we will all be cursing again!!!! I’m sick of hearing Albertans complain about equalization payments when they clearly have no idea how they work. FYI, the Alberta government does not pay one cent to the federal government (or other provincial governments) in equalization payments. Equalization payments are provided to provincial governments from federal coffers that are filled by federal income tax and federal corporate taxes. Equalization payments have exactly NOTHING to do with Alberta’s current problem; equalization is not a provincial expenditure. I support a logic person in office, not everyone is suitable for politics. Alison Redford government was a fiasco and a public humiliation because a woman was in power, a woman who has served Canada and elevated Alberta’s Oil economy. Jim Prentice is not suitable for parliament office, he would be more suitable to work on a farm or a car wash. EDMONTON Mayor Ivenson , has done a better job in EDMONTON, than former mayor Mendel ever did.